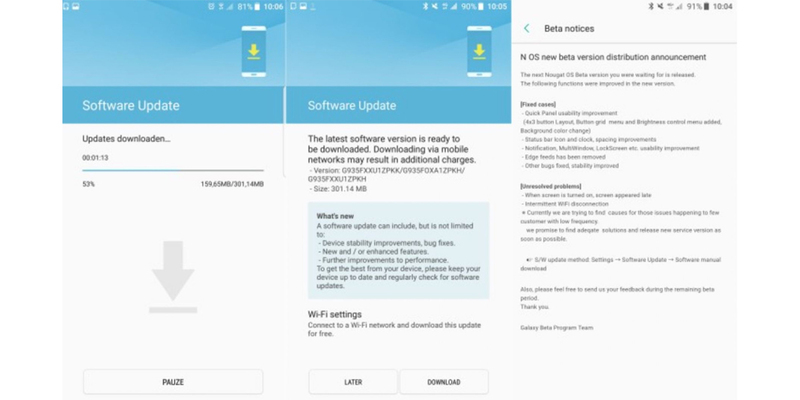 In the last hours Samsung developers have begun the deployment of the third beta of the firmware based on Android 7.0 Nougat and Grace UX for Samsung Galaxy S7 and its variation Edge. This is the second beta update that is released in just three weeks. In addition to having fixed many bugs that proved to be very unstable in the previous beta, developers have also added some new features, such as the choice of Quick Toggles panel design (where 5x3, 4x3 and 3x3 can be chosen). Of course, as part of this new firmware, we will also find the security patches for the month of November. Galaxy Note 7 has definitely been withdrawn from the market, but the new TouchWiz will be introduced into the Samsung Galaxy S7, which has taken over in terms of sales and updates to Android Nougat (when it should have been the other way around). No doubt, most fans and experts of Android ecosystems have already found a way to update the firmware to Nougat, but there are also others who prefer to wait for the official update, which could be given later this year, or early 2017 as late. The manufacturer has decided to pay close attention to the demands of beta-testers, refining some important menu items, and modifying some previous beta changes. From a technical point of view, the firmware we are talking about has the G935FXXU1ZPKK build number and, in case you have a Samsung Galaxy S7 or a Galaxy S7 Edge, and you already have the second beta version, the third one weighs around 300 MB and you should be notified to download it right now. In addition, Samsung intends to partner with new companies for the supply of fingerprint sensors with the clear intention of bringing this component to the entire market, including also the low range.